Scarves in the Round AND Giveaway! 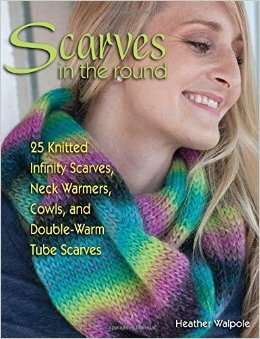 I’m really excited about this new book that was just released: Scarves in the Round — 25 Knitted Infinity Scarves, Neck Warmers, Cowls, and Double-Warm Tuber Scarves by Heather Walpole. Why do I love this book? Because everything is knit on circular needles and I LOVE my circular needles. So much, in fact, that I often use my circular needles in place of straight needles. I also love the fact that Heather Walpole devotes a section to “Basic and Beautiful” – these are simple patterns made entirely with knits and purls. Added bonus – some of these are made with big needles, making the projects quicker to make. For the more skilled and/or ambitious stitchers, there is entire section devoted to lace designs, and a section on cables, twists and bobbles. The last pages of the book contain a lot of useful information (with pictures) about blocking, techniques, and stitches – a very useful for the beginning and less skilled knitters. You can get a sneak peek at the book HERE. The book is available for purchase at Stackpole Books or Amazon. OR if you would like to try to win a free copy, leave a comment on this post telling me about the last cowl you knit or crocheted OR what interests you about making a cowl. I will select a random winner from all comments (1 entry per person) on July 31st. Meanwhile, I’ll have to decide which project I want to make first! This entry was posted in Knit and tagged Heather Walpole, Scarves in the Round. I love the idea of cowls – such a good way to add that finishing touch to any outfit! I wear a lot of solid colors and using some beautiful yarn really allows me to create some interesting color combinations. The last cowl I knitted was a pattern by Leedra Scott-Heirloom Goods on Ravelry. It’s called Smokey Mt. Mobius cowl and was a gift to my granddaughter last year at Christmas. And BTW–I never use straight needles-always use my circulars–can’t stand have the straight needles hitting the arms of my chairs! !